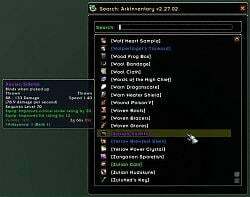 ArkInventory (AI or ARKINV) is an inventory mod that was based off EngInventory when the BtS 2.0.0 patch came out and I needed a working replacement. * changed - items that end up assigned to the default category now have that assignment cached to speed up display. 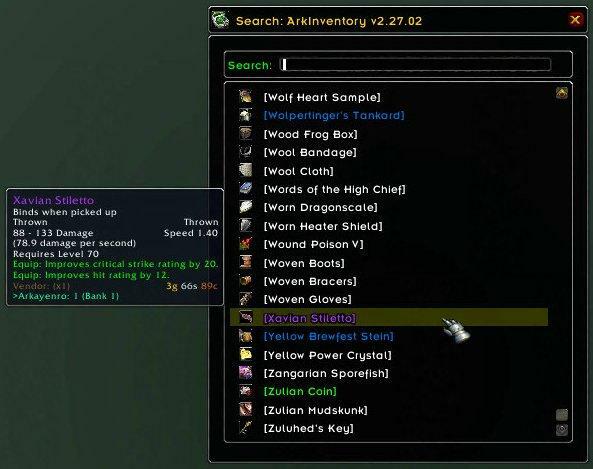 * added - category: "system > artifact relic" and "consumable > vantus rune"
* changed - category: "tradegoods > devices" and "tradegoods > explosives" merged to "consumable > explosives and devices"
* changed - category: "consumable > item enhancement" moved to "system > item enhancement"
* changed - category: "tradegoods > enchantment" merged to "system > item enhancement"
* removed - category: "consumable > scroll"
* info: consolidate will move profession items in normal bags and the reagent bank to profession bags, then move crafting items in normal bags to the reagent bank, then move crafting items in your bag to the bank. * note - crafting using bank items has NOT been tested, item counts may not update. Reagent Bank item counts will update. * updated - item relocation will now clear the cached rule/category assignment for that item. allows for custom rules to work better. * note - (cataclysm) LDB mount object icon wont update in real time unless you have one of each type of mount on an action bar (anywhere), summoning will work properly regardless. * note - ldb water mounts will not be summoned in vashj'ir when youre on the sea floor (youre not swimming), you must jump off to begin swimming for them to work properly. * added - slash command /ai track [ itemlink | item name | item id ], an invalid input will return a warning. if using the item name you must have the item in your bags. * added - quest item "glows"
* fixed - dragging an item while the cursor is in target mode (blue glowing hand) would cause a blocked action warning. dragging is now disabled while in target mode. * changed - bar movement - reduced to 2 options, "move" and "move > complete"
* changed - "new item indicator" no longer global, now per settings option under "menu > items > new"
* changed - "remember offline data" no longer global, now per character (enabled by default) "menu > offline > ...."
* changed - "fade offline" no longer global, now per settings option under "menu > items > fade"
* added - ability to hide or show the contents of a bag via right click menu on the bag in the bag changer window. hidden bags are tinted red. this is a per character setting. * changed - header, bag changer and status frame hiding is no longer global, it is now a per settings option under "menu > window > hide frames"
* changed - "menu > hidden frames" changed to "menu > hide blizzard"
* added - "menu > items > anchor"
* changed - sorting options are now coloured to make it more obvious which options have been included and which ones haven't. the tooltip text has also been updated as well. * added - ability to use PT categories as "custom" categories. Custom PT categories have first priority when items are being categorised. * changed - if the blizzard frames are not hidden then AI will not appear at all. use keybindings to bring up AI when blizzard frames are active. auto-open options are ignored but auto-close options are still used. will probably have to move this to the parent menu so it's more obvious now. Last edited by joeygiggles : 03-27-19 at 07:07 AM. I've uploaded the full addon with fixes to Google Drive for anyone have issues with the patches. Are you sure it's from ArkInventory? Every addon using the ItemButtonTemplate will have broken with 8.1.5. And I'm pretty sure I didn't miss any buttons since it's working fine for me, but if I did, I'd definitely like to know! Also, make sure that you are actually changing the correct files. I'm told that some people are having issues where they don't actually update the active files. Make sure the files you are updating are in WoW/_retail_/Interface/AddOns/ArkInventory. It sounds like you're not doing correctly. Last edited by Koviko : 03-15-19 at 08:56 PM. Last edited by joeygiggles : 03-15-19 at 08:52 AM. yup me 2, cant get it to work. Here's a fix for the current issues in 8.1.5. I don't use every feature in ArkInventory, so let me know if any of the features are still broken after applying the fix. Go to the Gist, download as ZIP, and then manually extract the two files to your ArkInventory directory. You are a saint, putting in that effort. Looks like all my rules are still active and functional. Last edited by damornkanata : 03-13-19 at 11:36 AM. Message: Note: AddOn ArkInventory attempted to call a protected function (CompactRaidFrameManager riginalHide()) during combat lockdown.